Queen of the 1990s, Deborah Compagnoni assured herself a place in Italian and Olympic history when she won gold medals at three consecutive Winter Games at Albertville (1992), Lillehammer (1994) and Nagano (1998). 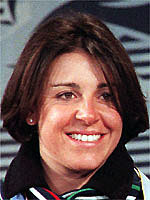 Before her retirement in 1999, the Italian champion dominated both the slalom and giant slalom, notably achieving double world championship success on home soil in 1997. Until Compagnoni's achievement, only three women skiers had managed a world championship double: Dagmar Rom (1950), Marianne Jahn (1962) and Erika Hess (1982). However, the knocks she took on the way to winning her six major titles took their toll and it was only her strength of character and superb technical skills that saw her through. In 1989 Compagnoni nearly died of a serious stomach illness. Then she was underwent a series of knee operations which forced her out of the downhill high-speed events she excelled in - an indication of her potential was her stunning fifth in a downhill at Val d'Isere when she was just 17. Thereafter, the Italian was unable to make any serious claim to the overall World Cup title and had to be content with 16 World Cup victories including 13 in the giant slalom which helped her to the World Cup title in that discipline in 1997. She stole the hearts of her Italian supporters at the Albertville Games in France in 1992 when, after winning the super-G gold medal, her attempt at the double in the Giant ended in agony and tears. Just 18 seconds into her run she crashed heavily, badly tearing ligaments in her left knee. She put that setback behind her to win win the Olympic giant slalom at Lillehammer in 1994 and successfully defended her crown four years later at Nagano, where she also picked up silver in the slalom. In 1999 shortly after her retirement, she married Alessandro Benetton, the heir to the famous company known for its clothing line but found herself being investigated for alleged tax evasion following a search of her home and the offices of her personal assistant by fraud officers. On a lighter note, one of the pistes used at the 2005 world championships in her home town of Bormio was named in her honour.